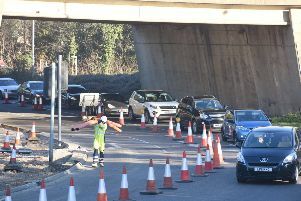 The dualling of the A47 between Peterborough and Walton Highway could be complete six years sooner than originally estimated according to Mayor James Palmer. The opportunities for time savings come from three main areas where the Cambridgeshire and Peterborough Combined Authority. The first comes from managing the projects with a focus lean, efficient processes coupled with quicker decision making at key gateway stages. The second focus will be on how projects can be funded quicker upfront, with phases overlapping rather than running sequentially. The third element is how the Mayor’s direct connections and lobbying of central Government and its agencies like Network Rail, can target barriers and red tape that typically hold back infrastructure projects. The report from Mayor James Palmer's office states that six years can be saved, from the 2033 projection, by changing the method of delivery. That involves taking a single route approach to planning and constructing the scheme, rather than dividing the scheme into four separate sections. Advanced desktop study work, including digital terrain modelling, and geotechnical and topographical surveys would also speed up delivery. As part of the report the Mayor said: “The need for investment in our transport infrastructure is clear and obvious, and people rightly get frustrated by delays and false dawns when it comes to getting them delivered. “A big part of the responsibility of the Combined Authority and me as Mayor, is to challenge the delays and these unnecessarily long processes that are holding us back. So when Network Rail told me a Cambridge South station won’t arrive until 2025-2027, when Highways England will commit only to dualling two miles of the A47 and when solving the rail bottleneck at Ely is still not guaranteed, I’m simply not prepared to consider this acceptable. “The interim findings of the Cambridgeshire and Peterborough Independent Economic Review (CPIER) highlighted the excellent growth in the economy in this area, but warned that continued prosperity is at risk unless we invest in upgrading our transport infrastructure. Better connecting the whole of the county will also share that prosperity more evenly, by opening up the economy to more people, and giving them better access to jobs. “But the CPIER review also supported my belief that the need for this transport upgrade is urgent. We already need a dualled A47 and A10, we already need a Cambridge metro and Cambridge South station and we already need to be investing in other transport corridors that will better connect the Combined Authority area together. “That’s why in my May Interim Transport Strategy Statement, accelerating the delivery of our essential projects was a key element. I’m delighted that this Combined Authority report has found what cumulatively amounts to years of time taken off the completion time of these schemes. The benefits will be seen in economic and jobs growth, more housing, and ultimately improving Cambridgeshire and Peterborough as a place to live and work. The paper will go before the Combined Authority Board on July 25. The board will be asked to approve officers going away and looking further into how models can be used to accelerate delivery, for reporting back to the September board meeting.